THE Academy Theatre in Gainford is one of the hidden gems in our area and is the home of Gainford Drama Club. Their latest production is a play by P G Wodehouse and Guy Bolton featuring the well known butler Jeeves. On the night I was there the play got off to a great start as the curtain opened on the living room at Towcester Abbey. 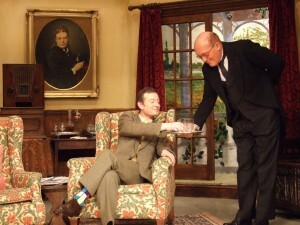 The set was applauded by the audience, which does not happen very often, and was certainly well deserved. It is not just the actors who have worked hard on this production The story follows Jeeves, John Chadwick, who is on loan to the Earl of Towcester, Thomas Brown. To cover his loses on the horses, the Earl has turned his hand to becoming a bookie with the help of Jeeves. Not everything runs smoothly, as you would expect as the Earl is tracked down by Captain Biggar, Michael Sillars, a furious punter who has not been paid. Add to the mix Lord and Lady Carmoyle, Allan Jones and Fiona Minay, who have arranged for a wealthy American, Mrs Spottsworth, Jean McCann, to view Towcester Abbey with a view to buying it and the Earl”s fiancée, Jill Wyvern, Susannah Carroll, who is becoming increasingly suspicious of the Earl”s actions, all the ingredients are there for a perfect farce. The performance flowed well with good characterisation from the cast, especially that of John Chadwick as Jeeves and Thomas Brown as the Earl, who worked well together providing many of the comic moments. 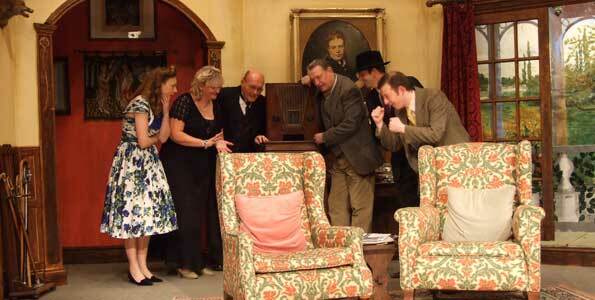 Come On Jeeves can be seen at The Academy Theatre, Gainford until Saturday, December 4.